Yoga is a physical exercise that has been in existence for many decades. The practice is done with the motive of achieving internal, external stability, flexibility, and mental calmness. Yoga and power yoga are some of the common methods of exercising. Power yoga refers to a method of physical exercise where an individual engages in the vigorous method of physical exercise. This method of yoga is mostly adopted in the western countries where individuals are involved in physical activities that are geared towards making them physically fit. Power yoga is done with speed such that the static form of practice is converted into a dynamic flow of exercises. 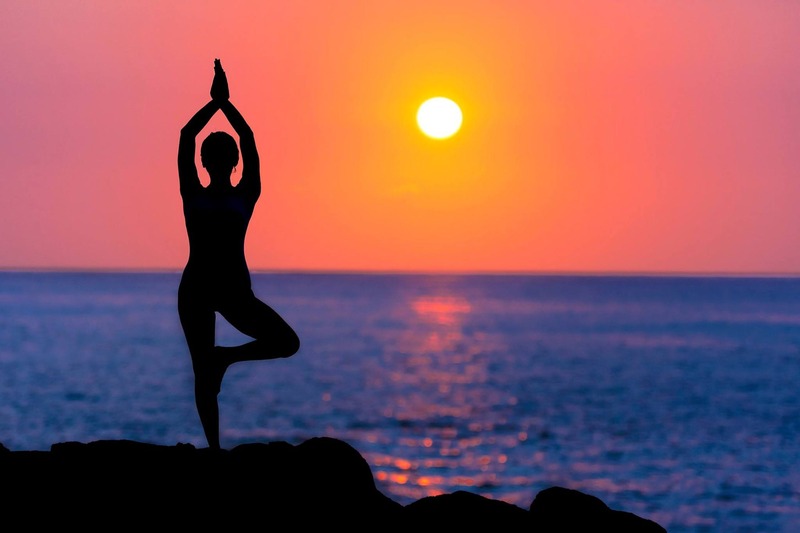 Yoga is a physical exercise that has been in place since ancient times where individuals are involved in performing exercises that are commonly known to be stiff and firm. Some of the benefits of yoga include enhancing internal and external body stability, mental calmness, and physical flexibility. One of the primary difference between yoga and power yoga is the speed at which the exercise is carried out. In yoga, physical activities are carried out slowly where moving of body parts is done with precaution while at the same time following a steady flow and a structured rhythm. Although power yoga follows a structured and a steady flow of rhythmical exercise, it is known to be quicker than the regular yoga. Physical activities are done with speed and body movements involves moving the body parts faster to increase physical fitness. When one is undertaking a yoga session, the instructor focuses on the position of an individual where specific body parts are supposed to be positioned in a specific way. This means that the body shape and the shape of different body organs must adhere to specific to increase output. Movements are slow such that the supervisor is in a position to view each person and ascertain whether they are following the required procedure. Power yoga moves with a speed which means that it is difficult for any person the body shape of an individual and positioning of specific body organs. Therefore, this type of yoga focuses on body movement. Yoga focuses on slow movements and a steady rhythmical structure where one must focus on the body shape and the positioning of specific body organs. This means that the mental aspects of an individual are highly involved which increases the mental stability of a person. Power yoga does involve a rhythmical structure and a steady flow of physical activities of an individual. However, this method of yoga involves rapid movements of the body parts which means that individuals highly concentrate on movement rather than mental aspects. Therefore, power yoga does not improve the mental stability of an individual. Both yoga and power yoga have significant benefits in the body of an individual which explains why it is an important physical activity. Yoga plays a significant role in ensuring that the body and mind remain fresh. Yoga focuses on physical fitness and mind freshness of an individual. By the virtue that power yoga is a vigorous speed that helps in ensuring the physical aspects of the body. The benefit of this type of yoga is ensuring that the body of an individual remains fit and firm. This explains why people geared towards physical fitness chose power yoga at the expense of yoga. The other difference between yoga and power yoga is the general stability of the body. Yoga gives internal as well as the external stability of the body organs. Internal stability means that internal organs achieve physical wellness while external stability helps external body parts to remain physically fit. Power yoga does not help or benefit internal and external stability of the body. However, this method of physical exercise helps in stabilizing the cardio output. This means that an individual’s blood flow reaching the body organs remains consistent. The membership of yoga is open to all individuals irrespective of their medical conditions because the physical exercises are carried out with ease. Yoga involves simple steps that help one to improve his or her breathing process. Additionally, it is a simple procedure that does not require supervisors. Power yoga is a complicated physical exercise that is not open to all individuals, especially those with medical conditions. For example, it cannot be undertaken by expectant women. Power yoga requires a supervisor. Yoga is a physical exercise that is carried out with simple moves which involve slow movements of the body while power yoga is a physical exercise that is carried out with speed and involves rapid body movements. Power yoga specifically focuses on body movements which help in improving cardiovascular output, physical fitness, and firmness while yoga focuses on body positions hence improving mental, internal, and external stability. Yoga is a simple physical activity that is open to all people irrespective of their medical conditions and does not require a supervisor. On the other hand, power yoga is restricted to people with medical conditions and requires a supervisor. Other differences between yoga and power yoga include speed of practice, body positioning and point of focus, and mental stability among others. Jecinta Morgan. 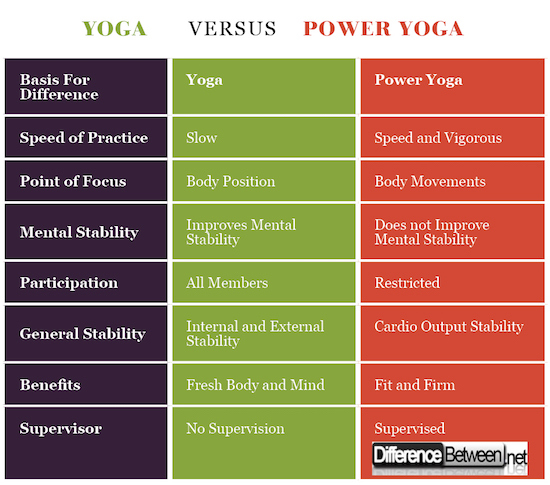 "Difference Between Yoga and Power Yoga." DifferenceBetween.net. April 3, 2018 < http://www.differencebetween.net/science/health/difference-between-yoga-and-power-yoga/ >. Buśko, Krzysztof, and Radosław Rychlik. "Changes of the maximal muscle torque in women training Power Yoga (Astanga Vinyasa)." (2006). Khalsa, Sat Bir S., et al. "Evaluation of the mental health benefits of yoga in a secondary school: a preliminary randomized controlled trial." The journal of behavioral health services & research 39.1 (2012): 80-90. Michalsen, Andreas, et al. "Rapid stress reduction and anxiolysis among distressed women as a consequence of a three-month intensive yoga program." Medical Science Monitor 11.12 (2005): CR555-CR561.